Home > Nightstand > Misc. I finished two books this week and believe it or not I’ve only added one new book to my current reads. Having mentioned Brooklyn Wainwright in the Tuesday Top Ten meme I thought it was a good time to revisit with the character and surprise, surprise there are now eight books in the series of the bookbinder who happens to solve murders on the side. So last night I started Murder Under Cover which is the fourth book in the series. I don’t read cozy mysteries very often but this one certainly appeals to me because of the bookbinding angle. In this book Brooklyn is going to help her best friend who finds herself framed for murder. A couple of new book s arrive in my mailbox this week. 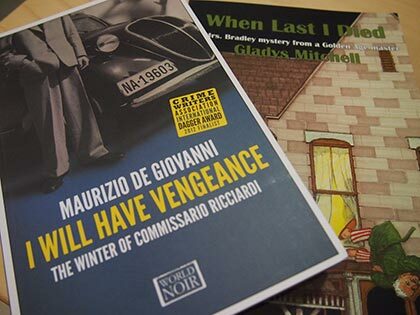 I Will Have Vengeance by Maurizio de Giovanni which is my February read for my mystery book group. It’s a World Noir book so I’m sure it’s going to be gritty and dark and thank goodness I’m reading a cozy to offset that. Ha. I also received When Last I Died by Gladys Mitchell. This one is for the Vintage Mystery Bingo challenge. I was a little stuck on which book to add to my list because when it comes to writers of the Golden Age of mysteries my knowledge is limited but I found Rue Morgue Press and wow, there are so many books to explore! I love finding a new bookish source, don’t you? Alright so that’s the scoop. I hope you are all staying warm this weekend. 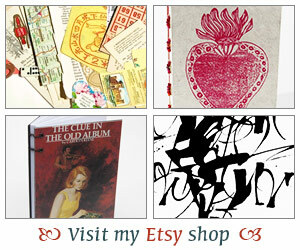 I’m planning on lots of cups of coffee and some serious bookbinding going on. This week I opened a ream of paper and cut up and folded the whole thing. 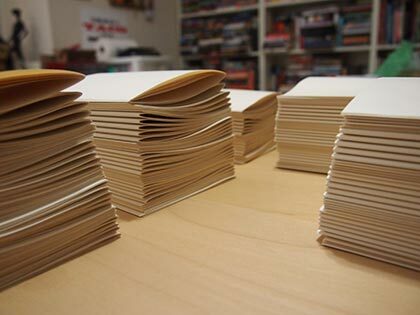 Now all of these signatures are waiting to be bound. I always enjoy mysteries with a bookish theme, but was not familiar with this series. I like the sound of these cozies, although like you, cozies are not always at the top of my list. But one about book binding and restoration? Oh, yes. I’ m not familiar with that cozy series either, but that isn’t much of a shock. It could overwhelm me if I allowed myself to think about all the series I haven’t read. Looks like you have your work cut out for you this weekend! I like the look of Rue Morgue Press, thanks for the link. I’ve read a handful of cozy mysteries and I did enjoy them. Happy reading! It sounds like I should check this mystery series out! Thanks for recommending The Crossing Places by Elly Griffiths to me! I finished it last night and it was SO GOOD! I cannot wait to read the next book, and am already planning on putting it on hold at the library. I just adored it so thanks for giving me the kick to finally read it!! Have fun with the journals. Forecast says there might be ice in Tyler, TX later this week. We avoided ice in the last two storms, so it might be our turn! This certainly is the ideal series for you! I hope you stayed warm over the weekend. Sounds like a busy weekend–the bookbinding sounds like fun! I wold like to try Gladys Mitchell sometime as well–so look forward to hearing what you think of her. And isn’t Rue Morgue a fun publisher–lots of good books to discover!